Repealing the Clean Power Plan puts the interests of corporate polluters ahead of the health and safety of the American public. The EPA’s own analysis shows that the benefits of the Clean Power Plan significantly outweigh the costs, and that its repeal will have a devastating impact on the planet at a time when we are seeing and experiencing the powerful effects of climate change in the form of rising temperatures, deadly hurricanes and floods, extreme droughts, and destructive wildfires. The League is appalled at this irresponsible decision that will have a long-term devastating impact on our planet and health of the American people. 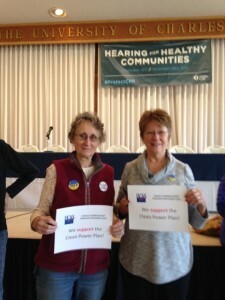 LWV-WV members Barbara Brown and Vicki Conner of Morgantown show their support for the Clean Power Plan at the Sierra Club's Hearing for Healthy Communities. Instead of repealing the Clean Power Plan, the EPA must strengthen the targets it currently sets, expand its scope to strengthen advancement toward clearer fuels and new technologies, and empower it to make energy companies and their investors pay for a comprehensive and just transition that reinvests in communities like those in West Virginia and Appalachia that have historically relied on fossil-fuel based industries, and in the working class communities and communities of color here and across the country that have been disproportionately affected by the impacts of fossil fuel pollution and climate change. Additionally, because the repeal of the Clean Power Plan will have deep impacts in these communities, the EPA must commit to holding further hearings in affected communities beyond West Virginia. To only hold hearings on the repeal of a policy that has national impacts in one state, and not in others, is undemocratic, unconscionable and unfair. The continued emission of carbon pollution and other greenhouse gases threaten the lives, health, and well-being of Americans and people worldwide. The effects of climate change are real and serious, and by repealing the Clean Power Plan and failing to take action to reduce these emissions we do so at our own peril. We are already seeing and feeling the effects of our warming planet when we experience more severe weather like this year’s deadly hurricanes and devastating wildfires, and other extreme weather events closer to home like the 2012 derecho and last year’s historic floods. All of these come with costs to human lives; damage and destruction of property and infrastructure, and higher costs to governments, taxpayers, and those who respond to these disasters and work to repair the damages. A warming climate also poses numerous risks for public health. Extreme heat can be a killer. Higher temperatures contribute to poor air quality including smog, a contributor to respiratory problems, as well as increased production and wider dispersion of allergens. Diseases may be spread more readily from an increased number of insects that would have been killed in colder winters, and more outbreaks of waterborne diseases such as cholera are expected. Those most vulnerable to climate related health effects — children, the elderly, the poor, and future generations — face disproportionate risks. Repeal of the Clean Power Plan ignores these risks and the major health benefits of reducing carbon and other other emissions that can harm human health. The CPP would be one of the United States’ most effective ways to reduce CO2 and other greenhouse gases, with less disturbance to the economy than some other proposals and with substantial benefits for the health and welfare of the American people. The United States has been known in the past for its innovative approaches to problems. The use of clean and renewable sources of energy has expanded tremendously in the last few years. These sources have the potential to make up a larger share of our electricity production – while reducing emissions and keeping the supply of electric power affordable and reliable. By repealing the CPP we are saying that the United States no longer has the capacity to meet these challenges. We will have decided that we can live with 19th and 20th century technology in the 21st century. We will allow China and other countries to take over the role of pioneer in new technology and production of energy. The longer we put off reducing our CO2 and methane from power production, the bigger the problem will become to solve and we will have to take more onerous steps. We must consider the lives, health, and welfare of future generations, and we must act now. To leave a warming climate and all its consequences to our children and grandchildren is unconscionable. Living for today rather than planning for tomorrow is considered to be frivolous. Do we want historians to label us as immoral and frivolous? If Aesop’s fable about the Grasshoppers and the Ants were applied to us, we would be the Grasshoppers because we were not willing to take steps today to plan for the future and protect our climate.